What started out as interior floor vacuuming quickly progressed to ripping out the 40+ year old carpet, padding and tack strips. Now what to do? There are some water stains on the wood. I'm wondering if I can treat them in some way, or if I should replace those areas? Then what would be the best flooring material to put down; linolium, wood, carpet? What are the advantages and disadvantages of each. My Airstream has the original of most everything. My problem is that many of the finishings are plastic and seem cheap. Some are cracked. I'm more inclined towards my own style than I am about keeping it original. In looking at pictues others post it seems a lot of folks change it to their own colors and finishes. Is there any real advantage to keeping all the original stuff? 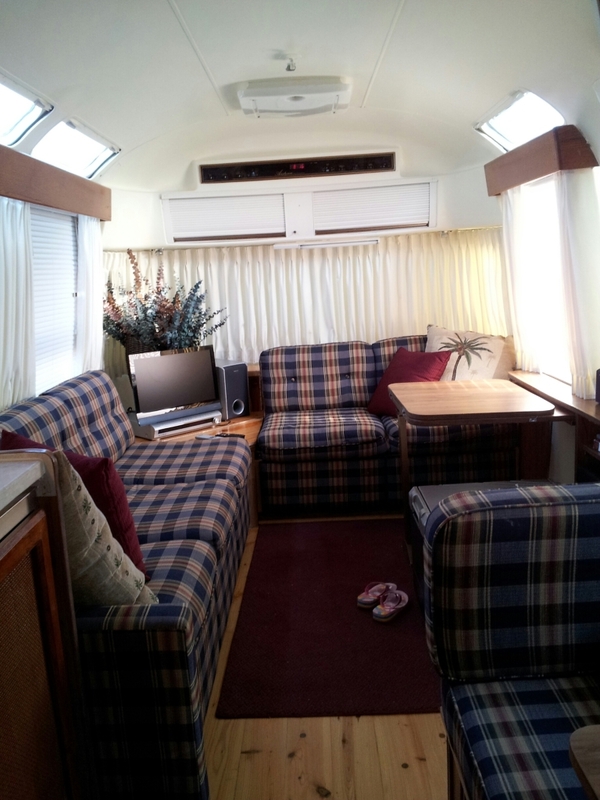 Probably the best flooring to put down in an vintage Airstream is marmoleom because it is seamless and waterproof. However I did not want a colored vinyl type look for the floor. I considered wood, engineered wood, laminate and cork flooring. All of these flooring materials can not get wet, and have their pros and cons. In the end I went with a cork floor because I liked the look and feel of it and it was a floating floor. This to me meant that if for whatever reason, I did not like the floor down the road, I could easily take this floor out and replace it with another floor. My plywood subfloor was 46 years old and quite solid. I applied 3 coats of polyurethane to protect the original wood plywood floor. This also helped in installing the interlocking cork floating floor because the surface was slicker. Now I believe this type of interlocking floor is difficult to install in a small area like a trailer. It interlocks quite well when you have lots of room to work with. You need the room to use a protective hammering piece plus a 2x4 wood piece plus room to swing the hammer. When you don't have room to work with it can be very difficult to lock the last edge pieces. I have actually finished the installation but still have 3 pieces that I have not finished locking in completely. Hopefully I will be able to get these last pieces locked in as soon as we return from a weekend camping rally at Highland Haven Airstream Park. In the end, I recommend choosing the flooring that you like the best. Also recognize, that any flooring that is installed with nails or adhesive is much more permanent than a floating floor and will be much more difficult to change out down the road. I just recently bought an airstream too and have the exact same questions, so glad you asked them. I plan to pull out the old carpet this week, went to Lowe's, Home Depot, and researching the internet to find the right flooring to replace. So maybe we can keep in touch, on ideas of updating. So much to choose from. Stains on the wood floor don't necessarily mean there is a problem with the wood. Check for softness; the wood needs to be hard to endure. What you read above is all true, many interesting floors can be done, but of course, the nicer ones all have steeper costs. Not to mention that it will really dress up your trailer. I am using wood grain floating vinyl, and Berber carpet. More vinyl than carpet. As far as the stains, take an ice pick and poke around along the edges of the wall and see if there are any soft spots hidden underneath it. Sometimes you get water stains from condensation, old leaks that were fixed or someone dropped a beer or two. As far as interior decor, do what you want. On my 1975 I am going back with pretty much an original interior with some minor upgrades. On my 1981 it is going to be full blown custom. After I purchased my AS, I pulled up old carpet and pergo installed some time ago by the PO. It smelled awful...apparently some unresolved leaks were finding there way under there. I aired it out, sprayed with bleach then painted the subfloor with an epoxy paint. I installed antique heart pine engineered flooring (nailed not glued). It looks great and has performed very well. I just put a small rug in the living room area, I figure that I can replace when it gets worn/dirty. There are many good options as mentioned in the previous posts. I have seen both cork and marmolium/VCT type products that have also looked great. Thanks for all the great information. Love the polyurethane idea to protect it. Love the look of the floor and the whole decoration theme C Lewis. Makes me for sure want to go with my own style and not original. I really don't think I can live with all the breaking plastic. When we were restoring our truck camper we had the same issues, plus the PO used for hunting and it was a heavy smoker and that was a killer for both of us. We were recommended to use Shellac Primer to treat the wood. Not only cover the stains and killed the odor but it acts as a sealer against mold the humidity, we are very happy with the results. Also what everyone is saying is totally true, specially wondering where the stains are coming from. Latex Porch and Floor is a good foundation for any floor covering or use it just like it is. My floor was stained and nasty after 30 yrs or being covered with shag carpet and god knows what rat fluids. We are using the bare painted floor at the moment and it looks fine with some throw rugs. At some point when I am 100% certain there are no more leaks, I will cover it with something. I suspect some sort of laminate. I am not for wall to wall anything that traps in moisture and is not removable for inspecting the sub floor. Be careful about "sealing the wood" with polyurethane or porch sealer if you are going to be installing sheet Marmoleum, vinyl or other glue down products. The glue for the finished floor material may not stick or be incompatable with the wood sealer. One of two things may happen...the glue won't stick or it could chemically react to the sealer and be a mess. When we had our Marmoleum installed, we did all the prep work ourselves to keep the cost down, but had a professional install the actual product. He said it had to be installed to the clean (uncoated) wood, if we coated the wood with anything he would have to remove it before installing the Marmoleum in order for the product & installation warrantiesto remain in effect. Thanks for the warning about sealing the wood. I am not disagreeing with you, but I would think that following the instructions for the manufacturer of the adhesive would also be in order. I would think that roughing up the surface with sand paper would provide an adequate surface for the adhesive, but then again maybe not. Anyway I don't have to deal with this problem now as I have just finished installation of the cork floating floor. Here are some photos of the finished cork floor (except for installing the trim covering the 1/8" gap around the edge). That looks great. Thinking of doing mine in a similar fashion. I just have a S/O to deal with. Also has anyone ever put heating strips down? A heated floor on cold mornings should would be nice ! Here are some photos of the finished cork floor (except for installing the trim covering the 1/8" gap around the edge). That is a very good lookin floor! wondering what wre you [lanning on doing for "the gap"